Back last November, just a couple days after the 150th anniversary of the battle, I walked the ground, as part of a tour group, over the battlefield of Rappahannock Station. The tour covered the Confederate defensive position, held on November 7, 1863, and assailed by Federal troops that day. 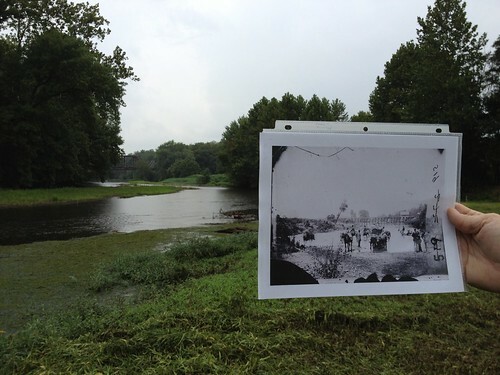 Roughly one third of the Confederate line lays within protected lands – managed by Fauquier County’s Parks and Recreation, with support from community organizations such as the Remington Community Partnership, Piedmont Environmental Council, and, of course, Civil War Trust. I’m glad we were able to walk that slope and appreciate the terrain. Because, just a few months later, that ground is forever changed … altered. 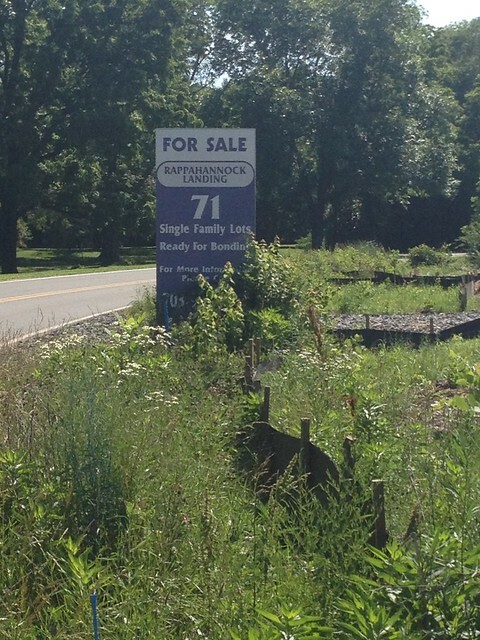 Soon to disappear under 71 new homes. A significant portion of the battlefield lost. We will, unfortunately, have to log this as a “lost opportunity.” I won’t name names at this point, but will say – figuratively and literally – a phone call went unanswered. I’m not saying that’s all it would have taken. But at least an attempt should have been made. Better to have gone down swinging with a last minute effort, than to simply let a battlefield to go under the bulldozers without a word. I know there are folks who will say we have enough preserved already. Maybe this battlefield – being such a small action – was not worthy of setting aside. That be the case, what have we gained with that sacrifice? And how does that stack with the sacrifices given on November 7, 1863? As my friend Mike Block is quick to point out, two Medals of Honor were awarded for action ON THAT GROUND. Sadly, I believe we are, as we proceed through the last year of the sesquicentennial, the last generation which will have an opportunity to preserve these battlefields. What started with five “military parks” in the late 19th century and grew to include hundreds of sites – federal, state, and local – is running out of time. During the 150ths, we have been able to walk much of the ground over which the armies traveled and fought. For the bicentennials, fifty years from now, the participants won’t be as lucky. They won’t have all the same opportunities to “walk the ground.” One of which – they won’t have the opportunity I, and my fellow visitors, had at Rappahannock Station. On January 25, 1864, Brigadier-General Henry W. Benham, commanding the Engineer Brigade of the Army of the Potomac, completed a lengthy report for Brigadier-General Joseph G. Totten, the Chief Engineer of the US Army. The report touched upon several subjects, but largely concentrated on improvements to bridging techniques then in use. This was not a new round of correspondence. Benham wrote a similarly lengthy and detailed letter to Totten in November 1863, discussing changes in the drill for pontoon bridging. I have the pleasure of inclosing you, for the further explanation of the method of laying these bridges, some photographic views taken during the progress of construction. No. 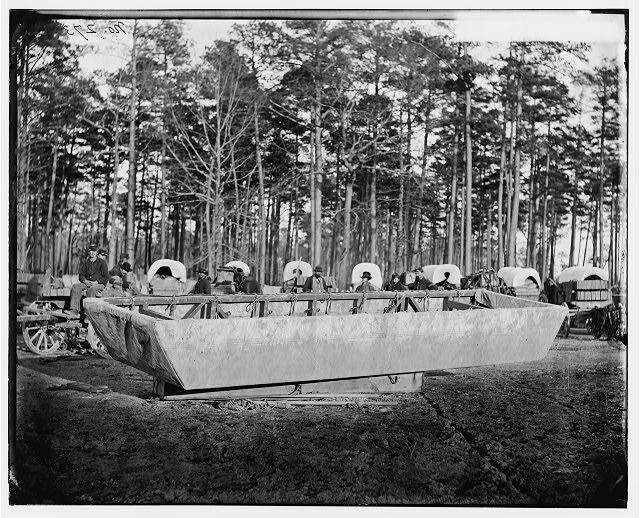 1 shows the pontoons ready with the material, and the boat squads ready for the construction (at foot of East Fifteenth street). No. 2 shows the progress of construction of the raft after four to five minutes’ labor. No. 3 shows the progress of the bridge raft after six to seven minutes’ labor. No. 4 shows the bridge completed, with the bridge squads formed ready to march off. Parts of a trestle and canvas pontoon bridge across a cove along the shore are in view here. No. 5 shows, from a nearer point of view, the pontoon bridge ready for service. Believing that they would also be interesting at the Department, I have also added two other photographic views. No. 7, showing the old or generally practiced method of laying bridges by successive pontoons. No. 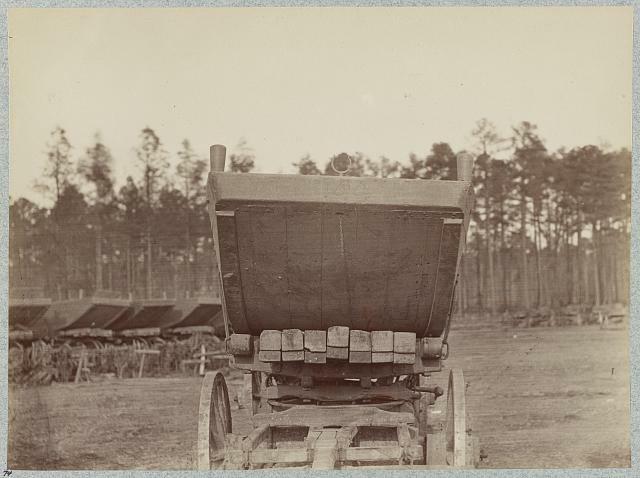 8, a view of the pontoon bridges laid by the engineer brigade under my command on the morning of April 29, 1863, at Franklin’s Crossing, 2½ miles below Fredericksburg. This shows in the distance the ruins of the villa of Mansfield, the site of General Bayard’s death. 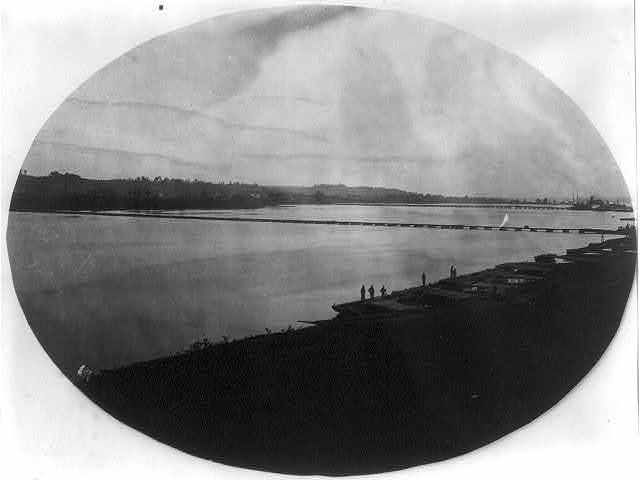 This shows two pontoon bridges across the Anacostia River, looking from the Navy Yard. Lots of neat stuff to discuss in this photo. But for today, let’s just consider this as establishing Benham’s practice of using photographs to support his suggestion (and I bet Benham would have loved PowerPoint!). The modification I propose (of which I inclose sketch) in the French pontoon is to take off 3 feet in length from the bow and 2 feet from the stern, while the “floor” remains of the same length, the ends to the depth of one plank downward to be of a thick plank or timber, with a shield or bunter which should slope about 3 inches outward. Fairly typical comparison diagram, using dotted lines to demonstrate the differences between the original and proposed modification. Probably sufficient to demonstrate the particulars for an engineer of Totten’s experience. But what do they say – “A picture is worth a thousand words”? How about this picture, might it offer a thousand words comparing two types of pontoons? Notice the difference between these two pontoons, particularly at the bow end. 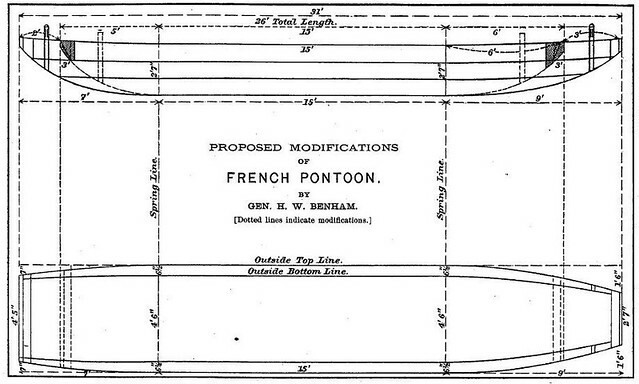 While not precisely matching the dashed lines in Benham’s drawing, the pontoon on the right is close to his proposed modification. Was this a photograph taken for the benefit of Benhan to demonstrate his suggested changes? 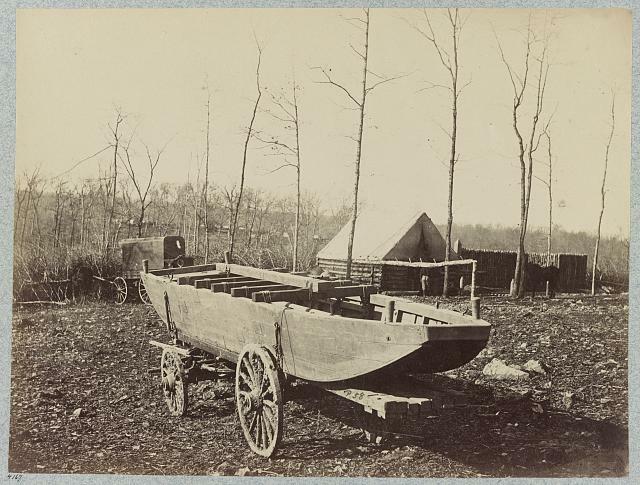 This view shows two of the boats (of which the army bridge is made) on wheels ready for the march. 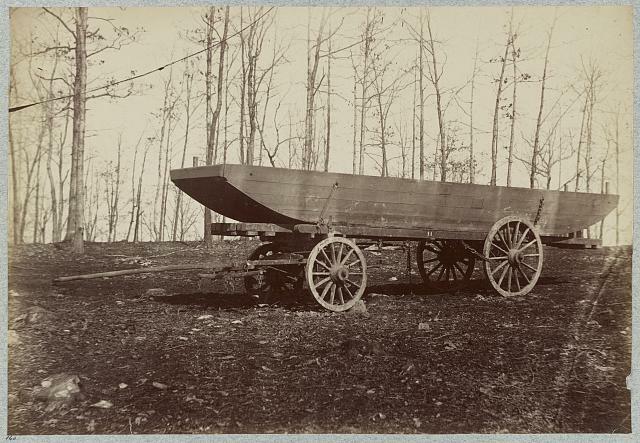 Each pontoon wagon is drawn by six mules. These pontoons were always getting stuck in the mud, and the soldiers, struggling along under their own burdens, were obliged to haul on the drag ropes, and raise the blockade. 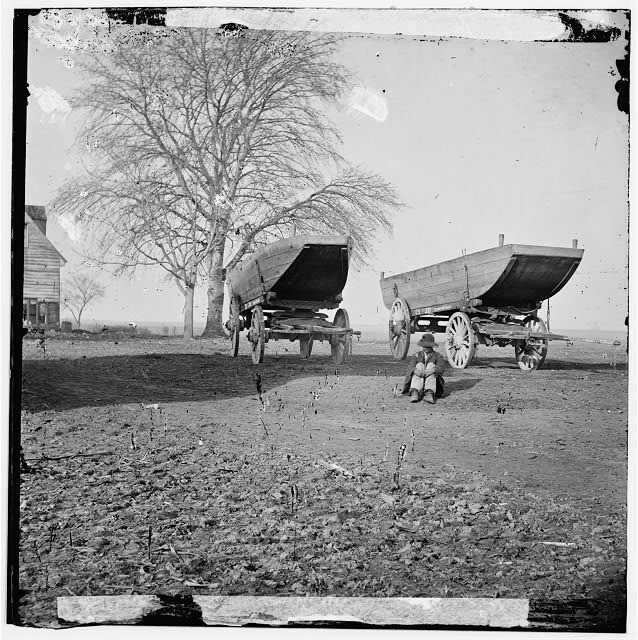 Probably no soldier will see this view without being reminded of the time when he helped to pull these pontoons out of the mud, and comforted himself by searing at the mules. Doesn’t sound as if this photograph captured a comparison of two type of pontoons. Maybe the studio felt the public would not appreciate the comparison, and thus offered a “pedestrian” caption. With more of these in the background… see them? That photo, in particular, just stands out as if tailor made for illustrating some manual. The men are in the background, not the foreground. The subject here is the equipment, not the personnel. These pontoon photos are like some “walk around” we would use today to demonstrate the particulars of a piece of equipment. Maybe the photographer was just hanging out with the engineers taking in shots of the equipment. But this is not some point-and-shoot camera we are talking about. These were expensive (relatively speaking) glass plate photos. So why waste a plate on some static equipment displays? On the other hand, perhaps these and similar photos taken at the 50th New York Engineer camp were intended to help Benham illustrate his reports. Something I’ve learned over the years – when studying Civil War photographs, it is just as important to know the “why” story as the “what” of the subject. 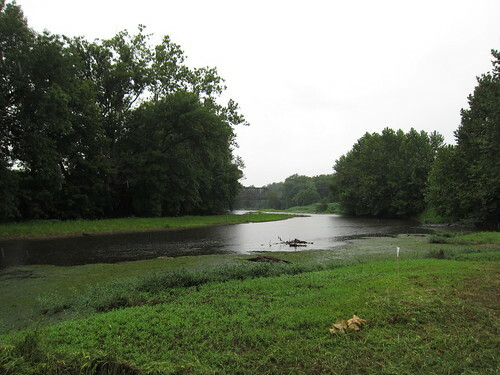 On August 22 I moved early to Freeman’s Ford, on Rappahanock River, where I had a picket the night previous, to carry out instructions by effecting a crossing if possible. 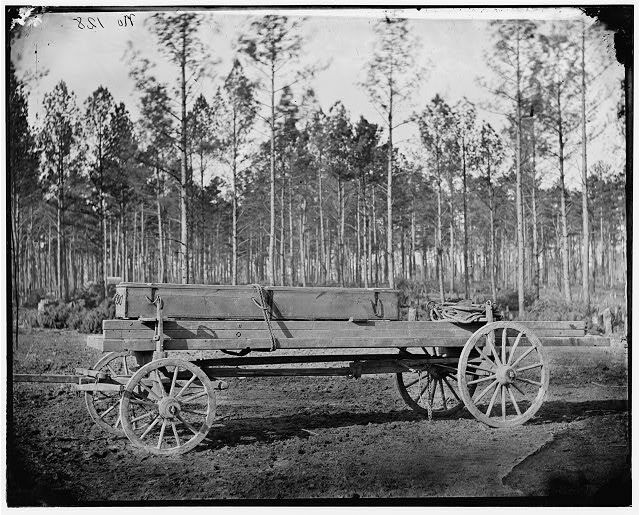 The ford was commanded by the enemy’s artillery and infantry, and four pieces of the Stuart Horse Artillery, under Captain Pelham, tried in vain to silence the enemy’s guns. Having advantage in position, he handled the enemy severely, though suffering casualties in his own battery. While this cannonading was going on General Jackson’s column passed just in my rear, going higher up…. (OR, Series I, Volume 12, Part II, Serial 16, page 730). … I received a note from the commanding general that my proposition to strike with cavalry the enemy’s rear was approved, and at 10 a.m. I started to the execution of the plan with the main portion of Robertson’s brigade, except Seventh Virginia Cavalry (Jones’), and Lee’s brigade, except Third Virginia Cavalry–say about 1,500 men–and two pieces of artillery…. Stuart goes on to outline his route as he moved from the ford to through the town of Jefferson to Waterloo Bridge and Hart’s Mill; and then to Warrenton. Stuart’s map objective was the Orange & Alexandria Railroad, specifically Catlett’s Station. Of course another objective Stuart had in mind was revenge – for losing his hat and being surprised days earlier at Verdiersville. 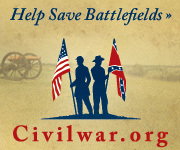 Another example of the “good fight” for Civil War battlefield preservation. At Remington, Virginia a portion of the Rappahannock Station battlefields are within the bounds of a county park. 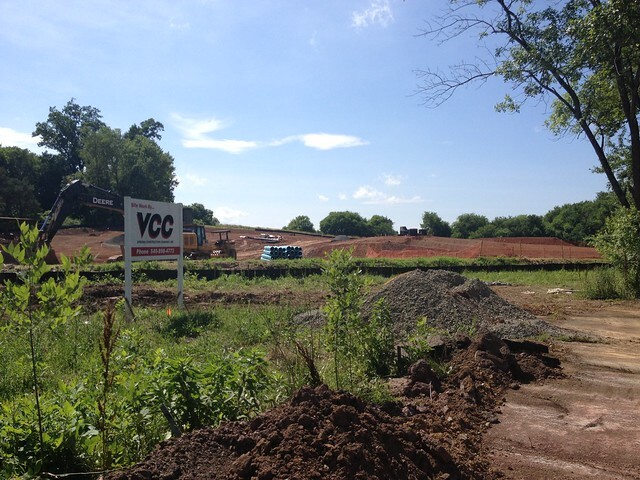 The Fauquier County Parks and Recreation Department acquired the ground, supported by several groups to include the Piedmont Environmental Council. A couple of years back, the department sponsored an archeological survey of the ground (summary posted here). Fauquier County is in the process of preparing an implementable interpretive park plan and conceptual park site plan for 26 acres of publicly-owned land along the Rappahannock River located within the Rappahannock Station and Rappahannock II core Civil War battlefields. Fauquier County Department of Parks and Recreation and its community partners seek to develop a historically and environmentally sensitive river access plan meeting local recreational needs and cultural tourism goals. The planning process will involve and educate the local community regarding the ecological and historical significance of this site. The corridor along modern US 15, the focus of “Journey Through Hallowed Ground“, features many historic sites including the scenes of Civil War battlefields such as Gettysburg, Brandy Station, and Cedar Mountain. 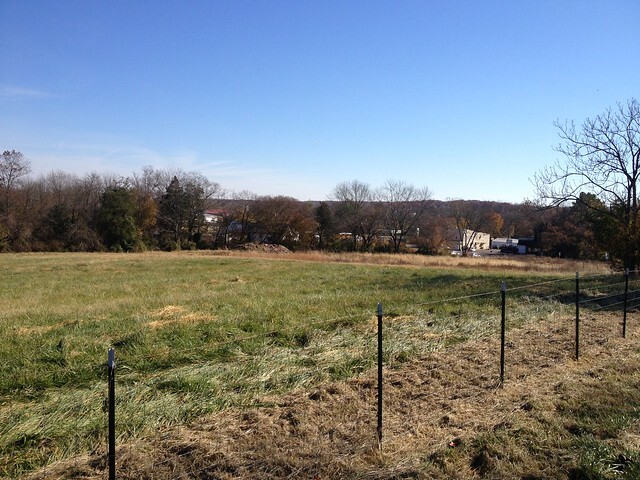 Adding interpretation to the Rappahannock Station site allows the connection of many threads in the Civil War story – the 2nd Manassas Campaign, Gettysburg Campaign (coming and going! ), Army of the Potomac 1863-4 Winter Encampment, and the Orange & Alexandria Railroad. In addition to the bugles and banners, the county park location is adjacent to the setting for one of the war’s most memorable photos. I applaud the efforts of those involved with the project. And I look forward to the day I can report about quality interpretive markers on the Rappahannock Station battlefields which orient and educate visitors.